Tonight on NBC, surprise! It's a brand new reality show! And they swear, no matter how much it resembles The Apprentice, it's totally different! This one takes place in The Law Firm, where attorneys compete for valuable prizes by trying real cases in court. Rejected titles included Litigating for Dollars and Who Wants To Be An Ambulance Chaser? 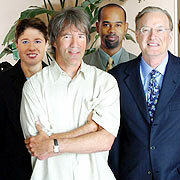 Uberproducer David E. Kelley wants his airtime back. He's bitching that networks are only allowing 41 minutes per hour for content, down from 43 or 44 just a few years ago. He pines to be on cable where the nooses are looser. Of course, there's no mention of how he'd react if he were told cutting commercials would likely mean cutting his budgets (and therefore his salary). ABC has decided to respond to complaints from critics by tadding a results show to Dancing With the Stars next season. The thirty minute show will air following an hourlong Dancingepisode. The couple with the lowest combined score from the phone vote will be eliminated on the results show every week, the network said. The show was accused by many of rigging the vote to favor ABC soap star Kelly Monaco (network executives and judges denied it). Personally, they should've kept rigging it. The possibility of covert hijinx was the only thing I found remotely interesting about the show- from a distance, of course. Producers say Geena Davis' fall vehicle, Commander in Chief, will spend more time on family and less time on nuts and bolts politics than NBC's stalwart The West Wing. The show, which is about America's first female president, also will attempt to not align with a particular political party- even though many of the show's creators are Democrats. The show will air at 9pm Tuesdays beginning in September on ABC.